I wanted to develop a platform system in the 5th Generation 4Runner that filled a niche left vacant by other offerings. Unlike the standard storage systems that are common in the overland scene, my goal was a more modular system that would allow for a variety of configurations, adaptable for different circumstances, leaving the 4Runner unmolested with the majority of the system using OEM mounting points and holes. This would allow for a "stock conversion" if desired. I also designed the system with simplicity and strength as core factors meaning less part failures and an overall reduced weight. This is my attempt at something unique, expertly crafted to be the best product available for its intended purpose. Meet the Explore4R Platform System. My typical cargo usually consists of the Ruff Tough kennel for the pup and a Front Runner Wolfpack (used to be Action Packer). When I switch to camping/Overlanding mode, I will typically add my camping boxes , the cooler, and other miscellaneous small items. All of these things needed to be secured in case of a collision/accident. The last thing that I want is for the dog kennel to smash around, or to see a fully packed Yeti cooler cruising through the windshield. A tie down system can also be more practical by keeping your gear secure when four wheeling as you start/stop/pitch/jolt. It was really clear that the stock 4 point system wasn’t going to cut it after a few 4wd trips, however for the better part of a year I have made it work. The 4Runner (without the OEM cargo tray) with the rear seats folded down does not allow the cargo area to be flush with the rear seats. It’s about a 2-3 inch drop, and that drop makes a huge difference when it comes to sleeping comfortably in the back. Like my issue with securing cargo, I was able to make it work using a yoga mat, and an extra blanket. It worked, but I slept terribly. When I camp and spend time outdoors, I tend to need a flat surface to perform various tasks. Cooking, organizing gear, working with maps, etc. In the past I have made due with cooking on my camping box, requiring me to pull everything out that I will need for the meal, and ultimately I forget something mid-cook. How hard is it to open the camping box while there is a full pot of water boiling on the stove? It’s very difficult, trust me. Sparing myself buying a table for camping, I thought having something that could be easily deployed when needed would be a great addition to this platform. When I design/start any project, I understand that even if it is well planned, and even better built, there is always the likely possibility that I will find some way to make it better. So I incorporated that reality into my build by using materials and a general layout that would allow me to incorporate drawers, a fridge slide or anything else later on down the road. The platform is constructed using strong, Baltic birch plywood. It is made of a hardwood ply, and unlike cheaper substitutes, it doesn’t use a weaker filler between the layers of hardwood. It is hardwood through and through making it very rigid and durable. The plys are bonded together using marine grade adhesive, and the outside veneers are thicker allowing for a more durable surface. It’s not a cheap material to use, but the benefits well outweigh the cost. The platform incorporates 4 aluminum L-track strips. Left, center, right, and against the rear seats. Each one with approximately one tie down option every 1-2 inches. This means that as cargo needs change, so do the tie down points. This variable approach allows for securing different cargo in different arrangements without compromise. A Line-X finish on the platform was used to increase the base material’s overall strength, provide a waterproof finish to the top surface, and to increase the long term durability of the platform. As an added bonus, it ended up looking like something that should have come from the factory as it closely matches the plastic color. The slide out is made of the same Baltic birch plywood, but with an added polyurethane surface protectant to seal it from water and other stains. The edges have been routed to provide a smoother grip when extended. The slide can come out approximately 18” with enough rigidity to hold a stove and food preparation supplies. It is branded with the Mountain 4Runner logo on the lower right corner. The platform attaches to the 4Runner using existing threaded holes, and only requires the removal of 2 plastic trim pieces. No cutting is required for installation. It fits with approximately ½” per side to spare, and enough room to fold the rear seats up and down without interference. With the main platform complete, I realized that I had a few important trip items that would need their own place to live on extended trips, namely the 40L Front Runner tank that would be my main water supply. I tried a few different configurations in the back of the 4Runner on the main platform, but none of them were entirely convenient for all of my different camping requirements. After looking at other overland/expedition style builds I determined that I would need to remove a portion of the rear seat to allow for more space. I still planned on having the 4Runner remain functional in everyday life, so I opt'd to remove the driver's side portion of the rear seat. By removing this side, I can still fit 2 people in the rear seat with the center and passenger side seats. Constructed with the same design as the Main Platform, the side platform uses a sturdy baltic birch piece as it's base, with integrated aluminum tie down rails and a Line-X finish to seal it from the elements. It is attached to a custom steel mounting bracket using stainless steel hardware. The bracket is designed to use the mounting holes for the rear seat, so there is no modification to the 4Runner needed for it to fit. It sits flush with the Main Platform, and close to flush with the remaining seat when it's folded down. After deciding to purchase a fridge, I realized that I needed a place to secure it in the 4Runner. I had already removed the driver’s side back seat so the next logical thing to do was to remove the remaining passenger side rear seat. Actually, it’s the perfect spot for a fridge. Easy access through the rear door, OR the front seat. 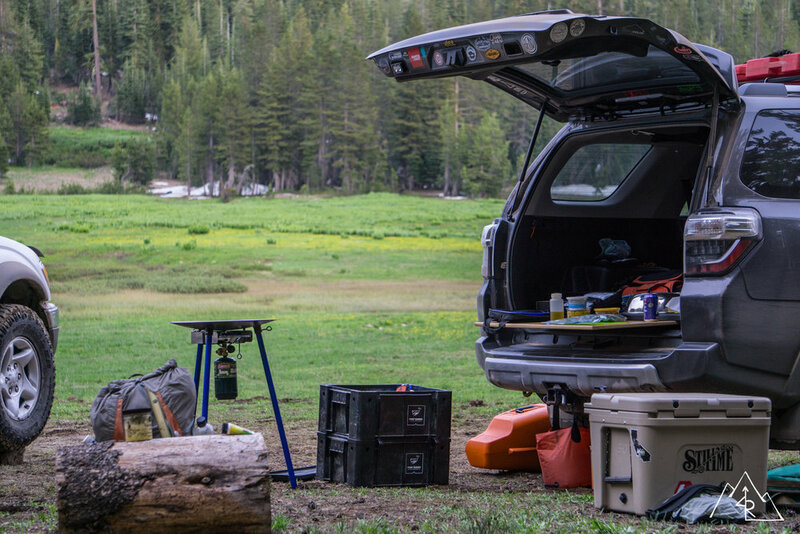 Most will secure their fridge in the back of the 4Runner, meaning to gain access they need to open the rear hatch (and swing out bumper if equipped) and then pull out the fridge on a fridge slide. That’s a few steps too many for a cold beer. Door, lid, beer. That’s as many steps as I need. 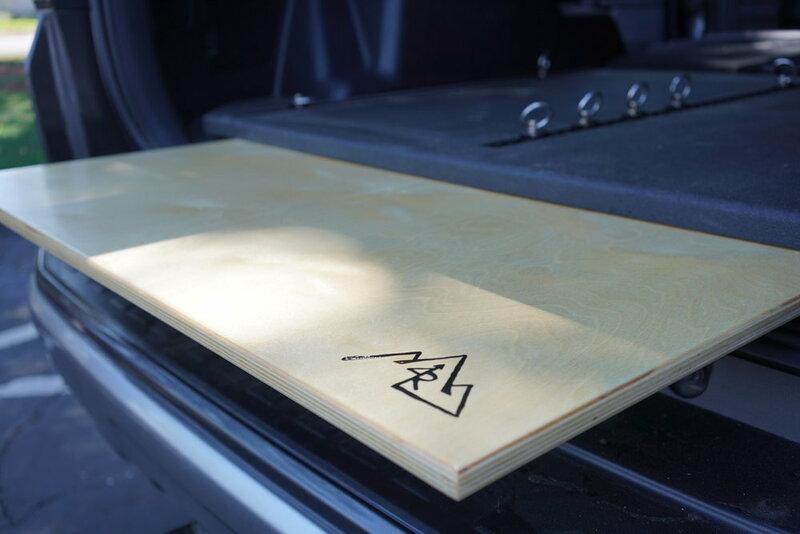 The platform is secured to the 4Runner using factory mounting points, is constructed of 3/4” birch plywood and a line-x finish. 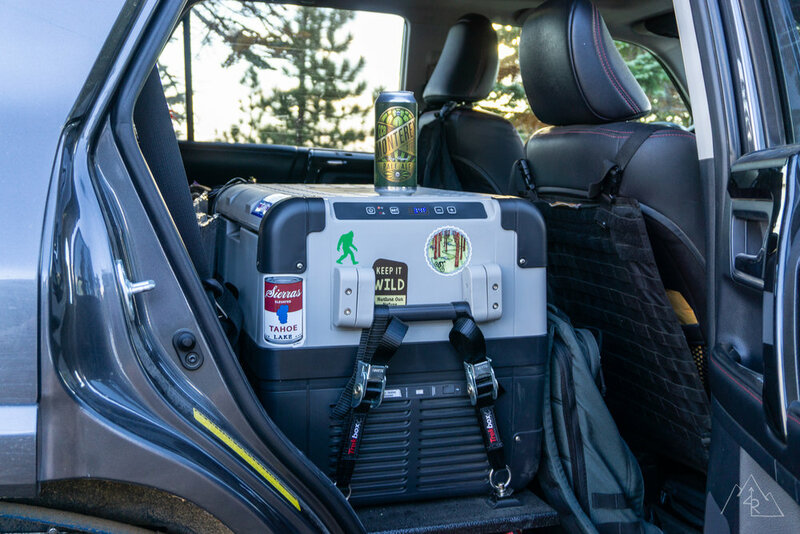 The fridge is attached with 4 Trekboxx fridge straps and L-track single mount points. It sits 3 inches lower than the main platform and the driver’s side delete to keep the top of the fridge as low as possible in the vehicle for loading and looking for food at the bottom. It’s a very simple and effective solution for mounting a fridge in the 4Runner. Using the driver's side rear seat platform as a base, I wanted to construct an elevated platform that would make access to my 40L water tank easier when filling a container. I also wanted to create an additional storage cubby for a Front Runner Cub Pack, the "Cub Pack Cubby", underneath because any extra storage is good storage on these vehicles. After I produced this unit, I found out that on shorter trips that don't require the water tank, I can add another Cub Pack to the top, or use it as a mount for my Stihl chainsaw. I have been on extended trips with a full water tank (88 lbs.) and have seen no signs of stress or failure with the tower. The tower is constructed with baltic birch plywood using lap joints to increase it's structural strength, which is needed to support a heavy and at times shifting load of water over rough terrain. Mounting blocks designed to fit the water tank hold it in place, and a pair of aluminum tie down rails paired with Strachits lock it down to the tower. The tower is secured to the rear seat platform with 4 stainless steel bolts, allowing for simple removal if more space is needed in the 4Runner. The Cub Pack Cubby securely holds an additional Cub Pack that can be used for recovery gear, camping supplies, or in my case dry foods and snacks. I will be adding a small fold down prep space to the face of the tower to secure the cub pack further, and allow for a place to set a pot / container when filling it from the water tank. Having quick access to basic essentials is a must when developing an organized vehicle. Sometimes access is part of a process though. For example, if you have 2 boxes strapped down together, you must remove the top box before accessing the box. The problem is amplified when it’s a go-to item, such as a chair, which might be used in between campsites when the vehicle is still packed. To solve this problem with my Blue Ridge Chair Works set, I created the hair Cubby to house them under the kennel. 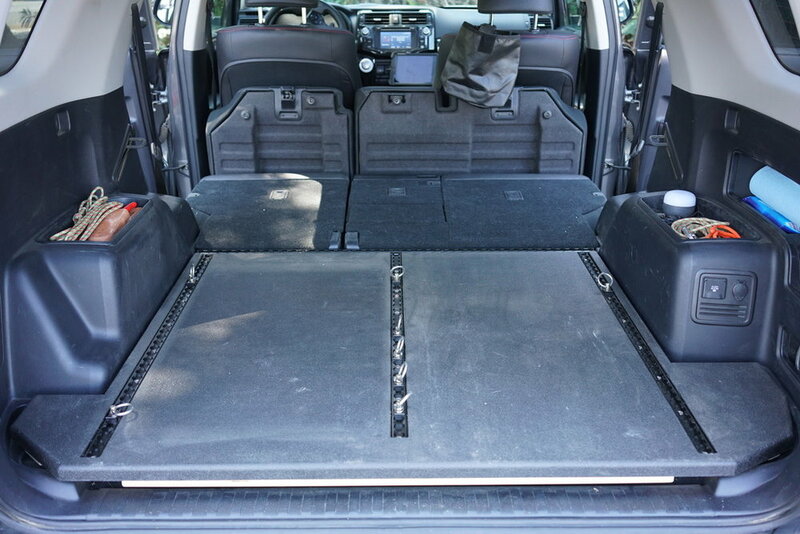 This space would otherwise go unused, and allows for quick access to the chairs regardless of how things are organized in the 4Runner. The Cubby is attached to the main platform with 2 Front Runner Stratchits connected to the platform’s L-track. This allows for some flexibility front to back, and for the Cubby to be moved from the driver to passenger side as needed. The kennel is attached to the Cubby with 4 L-brackets and bolts making removal simple. The two chairs slide into the main cubby, and are held in place with two Sea 2 Summit straps. As a bonus, the Blue Ridge Chair Works table folds up and fits just to the side of the Cubby. This fast and easy setup makes sitting down anywhere easy and organized. I won’t be going into full design details with this particular project at this time.